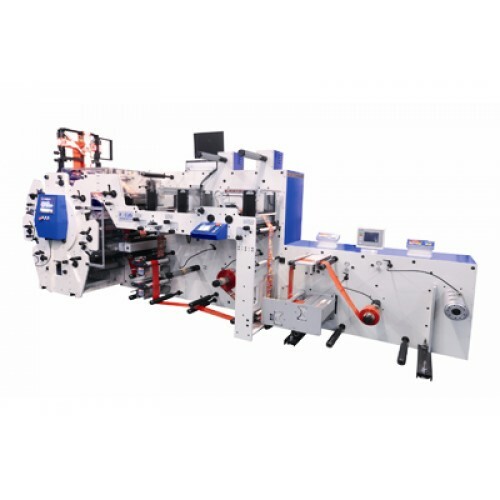 The Flexographic (flexo) printing press is one of the most efficient and consistent printing tools that we have in the market today, for all medium & long run print applications. Flexo continues to be the most popular of all web-fed technologies that has been deployed throughout the printing industry. A flexo press uses flexible photopolymer printing plates to imprint images across a wide range of surfaces, making it one of the most efficient methods for large volume requirements. Used widely for labels and packaging - flexo printing is reliable and provides consistently high quality print results at the same time. The printing method is similar to letterpress in how it works, except that ink volume is governed by a laser engraving inking roller – called the anilox roller. The process itself is relatively simple in theory, using a relief image plate, mounted onto a rotating cylinder, collecting then depositing ink onto the substrate with each revolution. The printing plates are made from flexible polymer material and are resilient enough to withstand millions of impressions. They can even be re-used several times, if stored correctly. The process can be roll to roll, or roll to sheet, and is capable of production speeds over 150 metres per minute, using UV cured inks and with a wide range of optional in-line operations & embellishments available. Although originally made from rubber, today’s flexo plates are manufactured from photopolymer materials and are usually exposed using ‘computer to plate’ CTP technology. The exposed design forms a relief image on the flexo plate, which is then applied to a print cylinder and loaded in to the flexo press. With each revolution of the cylinder, ink is transferred from the anilox roller onto the flexo plate and in turn, onto the substrate. This method enables high speed, high quality print, with consistent repeatability. Flexo inks need to be fast drying and are generally water-based, solvent-based, or UV cured. The type of work, length of run and often substrate type would determine the optimum ink type. The flexo process enables use of a range different ink viscosities, allowing specialist inks to be used for applications such as security print, light-fast outdoor labelling, fluorescent & metallic effects, etc. There is also the availability of food grade ink for food packages and environmental friendly inks. A flexo press can print on porous substrates such as cardboard, paper and fabric, and non-porous materials like plastic, cellophane, metallic and foil. The substrate is fed into the press in roll form, from the unwind unit. The tension of the substrate is then carefully monitored and controlled, allowing multiple colours to be simultaneously printed in-line and in register with each other. Flexo printing is often combined in a single operation with other in-line processes, such as laminating, varnishing, metallic foil embellishment, rotary silk screen printing, digital printing, die-cutting, embossing, slitting, sheeting, etc. In addition, chilled rollers can be used to control the substrate temperature, which printing onto heat sensitive materials. When you are looking to expand your printing capacity, speak to us about the right flexo printing press for you. Expect high quality and consistency, as these two go hand in hand with all the products we offer. Consider what type of printing needs your customers have and then select a press specification that suits your requirements. Flexo remains the leading technology employed in the mass production of printed images. For cost effectiveness and reliability, it is still to be unsurpassed. Our Ultimate Guide To Flexo Printing contains all you need to know about flexography and how it can benefit your business. Click here to download your FREE copy today.